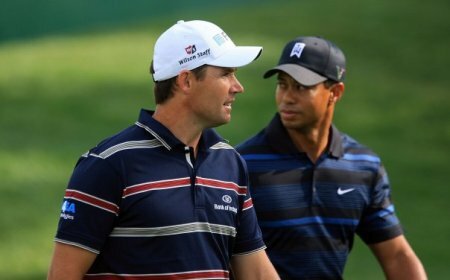 Tiger Woods has set his sights on Padraig Harrington's Open crown and his 15th major win. The world No 1 cruised impressively to his 68th PGA Tour triumph at Congressional on Sunday as pal Roger Federer claimed his 15th Grand Slam title at Wimbledon. Harrington and Woods want Turnberry title.Now Woods wants to get even with the Swiss tennis genius by denying Harrington a hat-trick of Open wins at Turnberry next week. Set to hone his game with coach Hank Haney this week, Woods said: "Hopefully I can play like I did this week and continue to build next week. Hank is coming down, hopefully we'll do some good work and continue to build on what we're doing right now. "You're just making sure that you can flight your ball and making sure you can manoeuvre it both ways efficiently because over there you don't know what kind of weather you're going to get. "You're going to get years like we had at St. Andrews where it's perfect, or you can get like a Muirfield day or what they had last year at Birkdale. "You just don't know, and you have to be able to be confident in controlling your golf ball and maneouvering it all around and feel like you can do it efficiently." While Tiger's confidence is soaring, Harrington's has been dented by five missed cuts on the trot. But the Dubliner hopes he can turn things around when he tees it up in the Ladbrokes.com Irish PGA at the European Club on Wednesday. Down one spot to 12th in the latest world rankings, he’s hoping history will repeat itself after taking back-to-back Opens just a week after winning the Irish PGA. Gunning for his sixth Irish title, Harrington said: "That’s why I play there – that’s why the Irish PGA is on a links course the week before the Open, half an hour away from me. I am looking forward to getting out there and playing." Padraig Harrington is expecting a rough ride in next week’s Open at Turnberry. And that’s why he insists that the €26,000 Ladbrokes.com Irish PGA Championship at The European Club is more important than it’s ever been to his chances of lifting the Claret Jug. TurnberryIreland’s triple major winner was shocked to find “the thickest rough I have ever seen” on a two-day trip to the Open venue on Sunday and Monday. But he’ll face something similar at Pat Ruddy’s County Wicklow links and reckons it is still not too late to boost his confidence and sharpen up his misfiring putter before he bids for a hat-trick of Open titles last achieved by Peter Thomson in 1956. Padraig Harrington is still searching for the magic key that will unlock the door to a hat-trick of Open victories. The 7th at TurnberryThe Dubliner touched down in Turnberry by helicopter yesterday and he was keen to see the two Bobs - swing coach Bob Torrance and mental man Dr Bob Rotella - with time running out to get ready for the world's biggest major. Asked if he was going to Turnberry with a feeling of trepidation or hope, Harrington said: “Definitely trepidation. My preparation hasn’t been right for this one so it’s a bit of a shot in the dark. For years we’ve been waiting for someone to stand up and take on Tiger Woods in a major. Finally, it appears that Ireland’s Padraig Harrington is ready to throw down the gauntlet. Not that you’d know that by listening to the recently crowned Open champion Steward Cink, who believes they may as well hand the 91st US PGA Championship and his 15th major victory to Woods right now.